In the ragtag posse of Whole Earth-loving hacker-designer-writer-artist-futurist iconoclasts that I hang on the edges of, the 1977 book A Pattern Language, by Christopher Alexander, is tantamount to a bible; it’s referenced with the same reverence as McLuhan’s Understanding Media. If the right rooms are facing south, a house is bright and sunny and cheerful; if the wrong rooms are facing south, the house is dark and gloomy. What’s not as well known as the astute aphorisms is that A Pattern Language is one of a trilogy that includes The Timeless Way of Building and The Oregon Experiment. 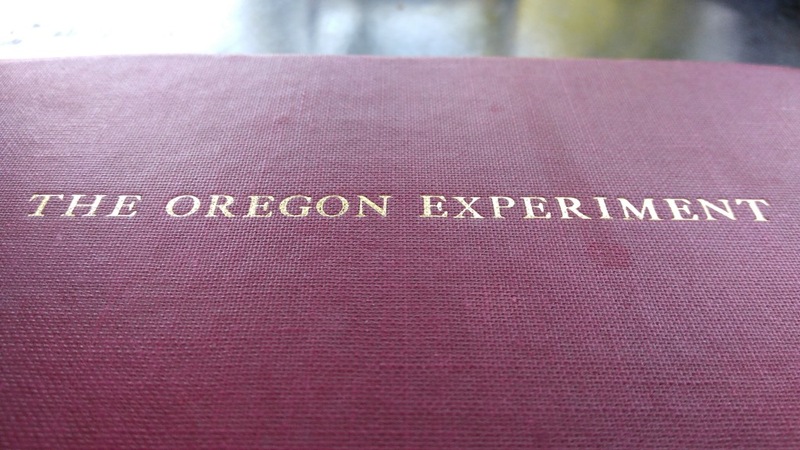 I’ve been reading that latter book over the last few weeks; it is a fascinating book that both puts forward a new approach for community planning and is also a master plan itself, for the University of Oregon. Let us try to explain why we believe this form of participating is so important to the University. There are essentially two reasons. First, participating is inherently good; it brings people together; involves them in their world; it creates feeling between people and the world around them, because it is a world which they have helped to make. Second, the daily users of buildings know more about their needs than anyone else; so the process of participation tends to create places which are better adapted to human functions than those created by a centrally administered planning process. The book goes on to describe this process by which these “daily users of buildings” will design the buildings themselves, designs that will then be implemented by architects and builders. This is not the way things are usually done: we are conditioned to expect that it works the other way, with some “centrally administered planning process” (a government department, say) designing something and then seeking “public feedback” on what it has conjured. This “consultation” has the appearances of being “participatory,” but is, in fact, the opposite. We’ve spent some time, as a family, in the offices in Charlottetown from which the Social Assistance program is administered, offices that are shared with the Disability Support Program that we’re there to see. The offices are squirreled away in an anonymous, windowless bunker in the Ellis Bros. shopping centre; the waiting room is as if in a prison, with glass partitions separating the clients and the staff, and absolutely nothing interesting to read except the proscriptive posters on the wall. It is not a place you’d want to spend any time, no matter who you are. What would a place like this look like if, rather than being designed by “central administrators,” it was designed by the people it is there to serve. I would like to find out. As I get older, and realize that it is my peers and I who are running the world, I am aware that this realization presents a fork in the road. One can seize the opportunity, leverage the experiences and connections a lifetime in the making, and seek to reshape the world as they’ve always thought it should be shaped. Or, instead, one can take the moment to reflect on who is missing from the group, who’s left out of participation, who’s having solutions designed for them, not with them. This reflection need not extend from simple altruism: participation makes better solutions. For everyone. And so when some are left out, and when the process is unbalanced, or merely consultative, it is a practical crisis, not a spiritual one. We are good at encouraging the former approach (it’s called “community leadership” or “entrepreneurship” or “political involvement”). We’re dreadful at the latter one, both because it involves re-balancing power, but, more importantly, because we lack the basic skills, collectively and individually, required to allow participation to live and flourish and become the way we typically do things. These two aspects of involvement–creative control and ownership–are of course related. You cannot control a place unless to some extent you own it. And you cannot have a sense of ownership unless to some extent you can control it. Students and faculty will never feel any true sense of involvement in the university unless to some extent they own their labs and offices, and unless, to some extent, they can control the changes there to suit themselves. Consultation engenders neither ownership nor control; participation does. Written August 2, 2017 at 4:38 p.m.